For the past two years, I thought, just to heap even more onto my plate, I’d make November a “sketch a day month” or SkADaMo (SkADaMo 2012, SkADaMo 2011) , for myself. Just trying to get back to the early days of my blog when I feverishly posted just about every single day. When my synapses seemed to be firing on all cylinders and ideas where presenting themselves to me faster than I could sketch or write them down. I even made a badge for myself the past couple of years and one again this year. I may be the only participant, but by golly I have a badge! If anyone wants to join in, they are more than welcome to grab this badge, off to the side here and start sketching. SkADaMoers are scoff-laws and Mavricks! (Really, I’m just not that organized.) The only code we live by this month is SKETCH! SKETCH! SKETCH! Sketch everyday from November 1 to November 30,or at least try to. 2. If you send me a link to your blog, (or wherever you are posting your SkADaMo sketches) I will keep a running list of all the participants and their links on my blog. This way we can all keep in touch and root each other on. If there are any broken links, bad links, I forgot anyone, misspelled anyone’s name or any other heinous act was performed, please let me know and I’ll do my best to correct it. Yay! Glad you’re joining again! I am going to give this a try! My website is lauraparkhurstillustrator.blogspot.com. Thanks! Great to have you Laura! Can’t wait to see your sketches! Cool Janet! I’ll post your link when things get started! Yay! I’ve got the badge. I love the monkey. We don’t have rules, but I have a goal: to post my sketches more than three times this year. I’ll be spreading the word for you starting tomorrow. Thank-you! Thanks Joanne! That’s a great goal and I’m very sure you’ll get there and probably more!!! Why not I say! Count me in!!! Why not! Hee hee! Fun! Oooooh, what you have up there now is really great, Leah! Can’t wait to see more! I’m in again! So glad you are hosting SkADaMo for another round, Linda! Great to see you back in the game Kathryn! Woo hoo! 🙂 Can’t wait. I had so much fun last year. This piece was sketched on Day 6. I later added color and my SCBWI friends liked it so much I used it as the welcome page on my website. So I’ve got the pens and pencils ready for the challenge! I just love that piece, Kathryn! Thrilled that is was inspired by SkADaMo! Thank you! See, you did a good thing, inspiring us all. Yay Heather! Glad you’re joining the shenanigans! Yay Julie! You blew my mind last year. Can’t wait to see what awesomeness comes out of you this year! Blew your mind, huh? Now, how can I approach the challenge in a relaxed state, huh? Guess I’ll have to call on my inner-Vincent (Yep, van Gogh still ‘speaks’ to me.) And there were times you might have thought you were weird? Gah! I’m so beyond my means with time, so why not?! Count me in! I may or may not post them since I do not have a blog, just a website , and I’m too tech challenged to post them there. But I’ll be sketching! I love your logo! I’m making a dummy for my pb right now and in it there is a monkey who draws. Yay Wendy! That’s great. The only thing that matters is you have fun and are inspired to do what you love. Posting is optional (0; However, if you have a Tumblr or a Flickr account, you can post there as well. This looks really great. I have signed up for PiBoIdMo for the first time so may as well give it a full effort and join this too. Sketching is more my thing anyway. And I need to get back to doing it daily. Thanks for the prompt. Look forward to sharing over the month. Hooray, Kev! Love your sketches to pieces! Wow, nearly November already, which I’ve come to regard as __ __ __ Mo month (insert any 3 syllables, add Mo and you have your project for the month). But of all the choices SkaDaMo is the most fun to say. It rolls of the tongue nicely and makes me want to say bazinga! I’m needing some new in my life so …I’m in! This will be my first year. Very keen for SkaDaMo 2013! Ok, I’m in. Don’t have an active blog, so I guess I’ll post sketches on my FB page for my book if thats ok. WooooHooooo! Yay Kathy! Posting to FB sounds like a great idea. It’s all about sketching for ourselves, but putting them out there just makes it more fun, but definitely optional. Wow! That’s really terrific! So glad SkADaMo was such an inspiration! Keep up the good work! What a great idea! I’m in! This is gonna be fun! Hoping this helps shore up the sagging blog, hee hee! Welcome Yvonne! I was just wondering if there was anything like this for illustration. LOVE the idea. (And think of all the revision and fleshing out we can do when the snows fly!) Thanks for the op. I’m gonna try to keep up. Yay, nice to have you Louann! I would love to be challenging myself with this, I need to sketch to go with PiBoIdMo so why not. 🙂 the more the merrier, bring it on! and all that bluster. Do we simply upload our sketches to our own blogs? 🙂 I am so excited really. I get to play with new technology, well new to me anyway. Great!! I hope it inspires me a bit more to sketch a bit more….lately I don’t sketch so much…. And this is a good “hand in the back thing”!! I hope it inspires too. I find it definitely sparks something! Welcome Susanna! Thanks Linda! I hope we have a great month coming up! I think this may be just what I need. Thanks, Linda!! I’m gonna do it, Linda. Thanks for creating this. Thanks Linda for organizing this. I’m going to do this too !!! I don’t have a blog, but I’ll give it a try. It sounds like fun! Let’s give it a go, see what happens! Thanks for the encouragement! This sounds like fun! I missed Inktober, so SKADAMO sounds like the perfect opportunity to make myself work on my craft, and post on my blog. You rock lady! Last year was so much fun…I can’t wait to see what you come up with this month! I did it Linda – thanks for the inspiration! I’m following after Karen Lee posted about it on her blog. I see I will be in good company. Thank you, Linda! I love seeing your sketches and artwork! 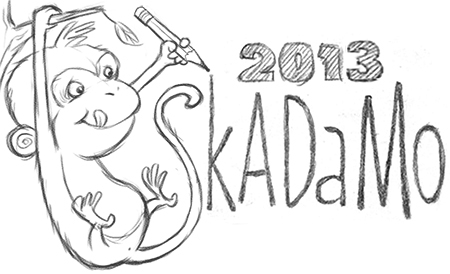 I look forward to participating in SkADaMo this year! Thank you for the inspiration! Love this idea, will definitely try to participate! It’s never really too late, because remember, no rules. It’s all about the sketchin’. So welcome aboard newcomers! Welcome aboard, Cathy! FYI, the link to your blog was actually http://tentomidnight.wordpress.com. But figured it out and you’re on the list! Happy sketching! Thank you, I just set up this blog (as you can tell lol) Looking forward to sharing sketches! I’m a couple of days late and more than a few dollars short, but I am in. GOOD LUCK to everybody taking part! Late, but intrigued. Will try to keep up with this challenge as well as do NaNo & PiBoIdMo. Should be a fun month! Enjoying your sketches! I’m in! So glad you created SkADaMo! Thank you very much!!! Please add me to your links and I will start posting sketches starting tomorrow. Cheers. I thought i added myself but I didnt. Hoping this will get me back into sketching, posting a couple times this month, and keeping it going through the year! I just realized who you are and that I have followed and studied your illustration; I really admire your work!! thank you for Skadamo, I drew and drew and drew through November and have not yet stopped. I am doing the ho ho christmas/holiday themed sketches too and intend to just keep sketching every day. Thank you again for giving me a kick start to my art. Hi Linda, am hoping you will be doing this again this year. Yes? Me too! I’ve been looking for any indication that it might be running again. Otherwise I might just have to go it alone! Me too! This was so much fun to do last year! Looks like it might have to be solo efforts this year. I really enjoyed the sharing last year though. I met some really nice people. i just need to catch up! Helllllooooo!!!! Linda. . .we are chompin’ at the bit here. I’ll be doing SkADaMo 2014 over on my blog all by my whittle self but sure won’t feel the same without our Queen Mother leading the way. Ah, she’s baaaack! I better scurry and get mine posted. I’ve been using the daily prompts posted over on Diane de las Casa’s Picture Book Month site. Today is non-fiction, Insect. Just pubbed my 1st post at http://ashleywolff.wordpress.com/2014/11/03/skadamo2014/. I am so glad to be part of this community. I’ll try to join in too, though my posts on my blog may be less frequent than daily. Nice to know others will still be doing the same. « PiBoIdMo 2013 is almost here!